Students meet with representatives from professional schools during the CCV Health Professions Graduate School Fair. Welcome to your Center for Career and Vocation! We are anxious to get to know you and to learn more about your goals and aspirations. Your CCV is your resource for choosing a vocation; planning for your career search; finding an internship; preparing your resume; learning about interviewing; preparing for graduate school admission; and finding a part-time job while in college or a full-time job after you graduate. A vocation is more than a job—it is an expression of your life’s calling. 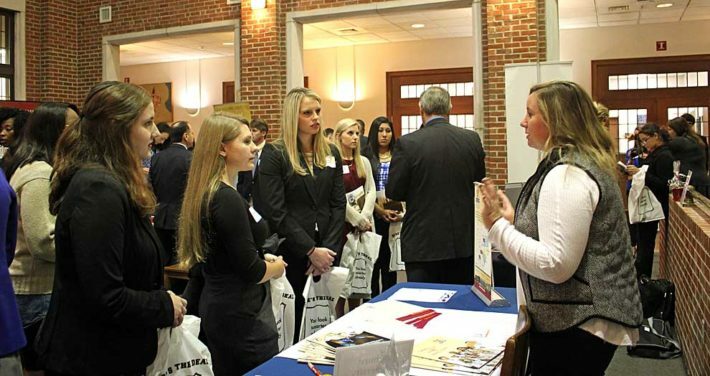 The Huntingdon College Center for Career and Vocation (CCV), part of the Office of College and Alumni Relations, assists students, alumni, and employers in finding where students’ skills, knowledge, and talents meet the world’s needs. In addition to the online resources we offer, there’s nothing like the personal touch. Stop by! Let us help you with all of your career questions and concerns. Office: Flowers Hall, 218; 8:00 a.m.–5:00 p.m., M–F, Fall/Spring; 7:30 a.m.–4:00 p.m., Summer; Walk-ins welcome! Director: Sherry Leigh Lacey ’13, (334) 833-4562; internships@hawks.huntingdon.edu or ccv@hawks.huntingdon.edu. Stallworth Dining Room | 11:45 a.m. – 12:45 p.m.
Stallworth Dining Room | 7:45 a.m. – 8:45 a.m.
Faulkner University Multiplex | 2:00 p.m. – 5:00 p.m. Flowers Hall 205 | 11:45 a.m. – 12:45 p.m.
Bellingrath Hall Chemistry Pod | 11:45 a.m. – 12:45 p.m.
Atlanta | 7:30 a.m. – 6:00 p.m. Flowers Hall 205 | 6:00 p.m. – 7:00 p.m.
Library Atrium | 5:30 p.m. – 7:00 p.m.
Library Atrium | 5:30 p.m. – 7:30 p.m.